Why is consumption monitoring helpful? Learn how consumption monitoring can help you shift your energy usage to when electricity is less expensive. Consumption monitoring measures the use of electricity in your home. It is a measurement of how much and when you are using electricity and is does not indicate either "good" or "bad" energy usage patterns. How you use electricity in your home will vary tremendously from how your neighbor uses electricity, for example. If your electric rate schedule is a time-of-use rate schedule, you are paying more for electricity during peak hours. Generally, for residential customers, peak hours are in the early to mid evening, when most people have returned from work and are at home. If you know that you will be paying more for electricity in the evening, you have the option of shifting your usage to earlier in the day, either before you leave for work, or when solar production is at a peak. Consumption monitoring helps you see exactly what your usage patterns are so you can make changes. 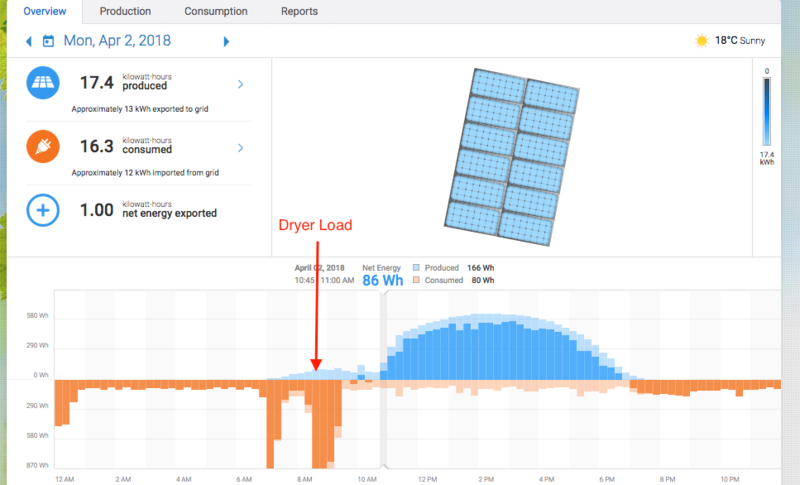 In the example below, this homeowner has opted to run their electric clothes dryer in the morning, to avoid the expense of running it during peak hours when when the cost of electricity is higher. To learn more about consumption monitoring, visit the page here.